Utilizing the social mechanisms of dolphin behavior as a metaphor, workshops, lectures and seminars encourage communication and connection among participants. Corporate settings may encourage excellance and team-building. Here is a unique opportunity to enhance these skills by allowing management and leaders to interact in a non-competitive, vulnerable environment. Harmony, integrity, and faith in self are qualities to carry from home to work and not lose along the way. The use of specific participatory energy-building exercises and hands-on experience in connection to intuition will enhance humanity in the workplace and alleviate the sense of separation. 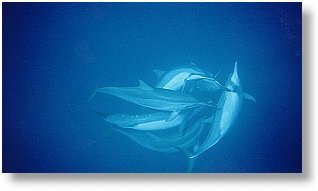 Much more can be accomplished in a group energy field which is an example of how dolphins cooperate successfully and maneuver their environment. "Sometimes it takes great fire to crack Nature's seeds open for something new to bloom. Today, our most innovative leaders acknowledge the need, the strength and the value of using group energy. We live in a world that needs us to create and maintain that fire."